A major tool for college students and creative professionals alike, Apple’s laptops have dominated the way users approach productivity on the go. 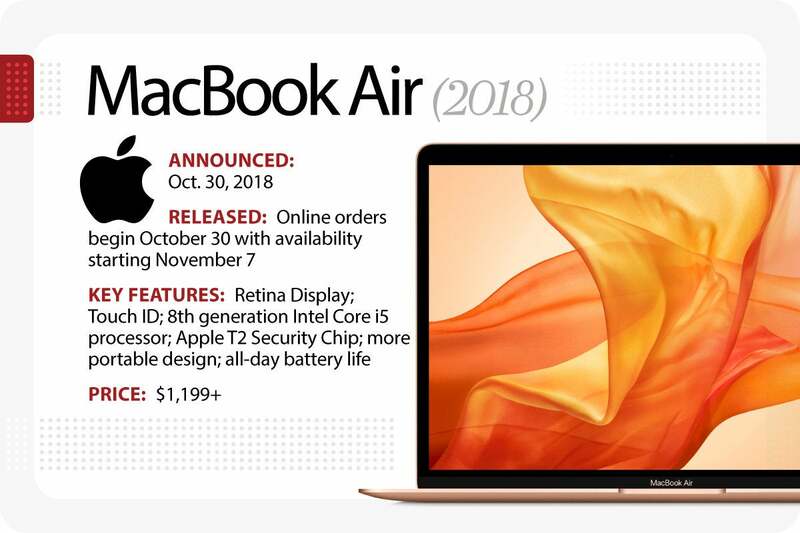 The MacBook turned 25 two years ago -- though there have been a variety of different naming conventions and models over the years -- and Apple recently highlighted the latest iteration of its popular portables during its October rollout of the 2018 MacBook Air. 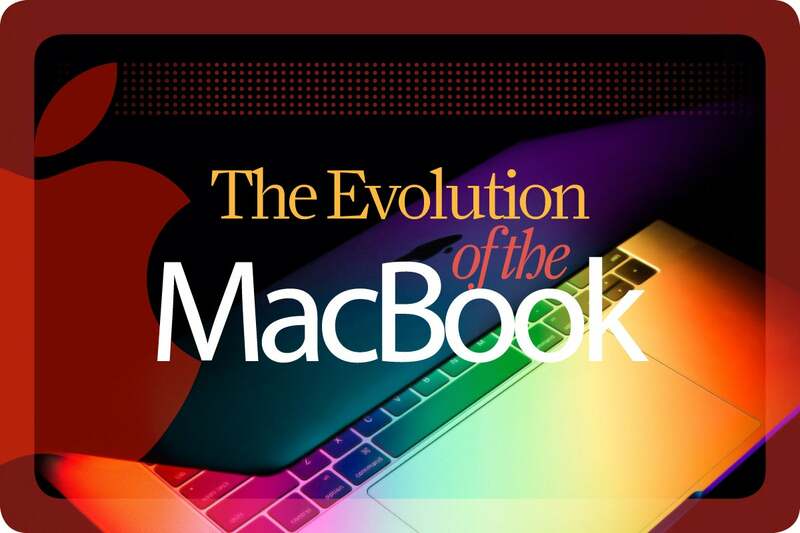 From the PowerBook to the MacBook Pro and the Air, we explore the evolution of Apple's laptops and the innovative changes each generation brought. 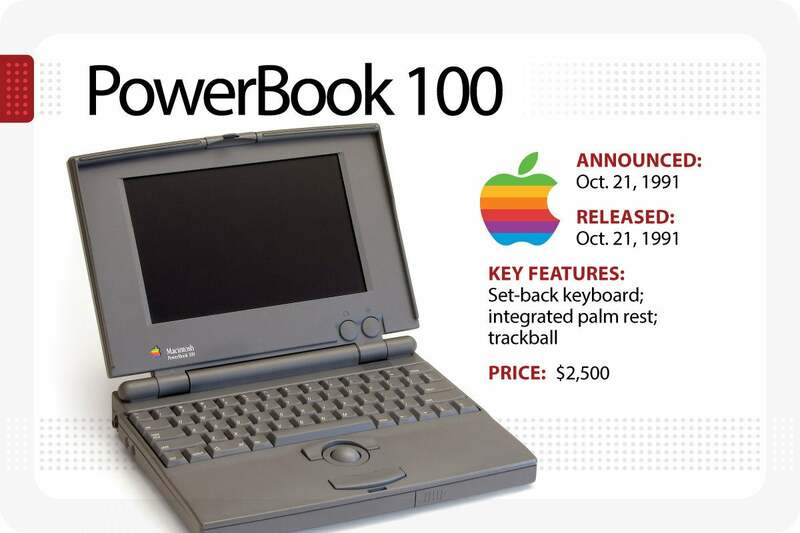 A successor to Apple’s first-ever laptop -- the Mac Portable -- the PowerBook 100 featured a setback keyboard, which made room for palm rests, and a front-and-center trackball -- for both left- and right-handed users -- that would set the default standard for laptops. Although it was criticized for lacking a floppy disk drive, it went on to become a huge success. Manufactured by Sony, it featured a Motorola 68000 processor, 2MB of RAM and a 9-in. backlit LCD. PCworld named it the 10th greatest PC of all time in 2006. 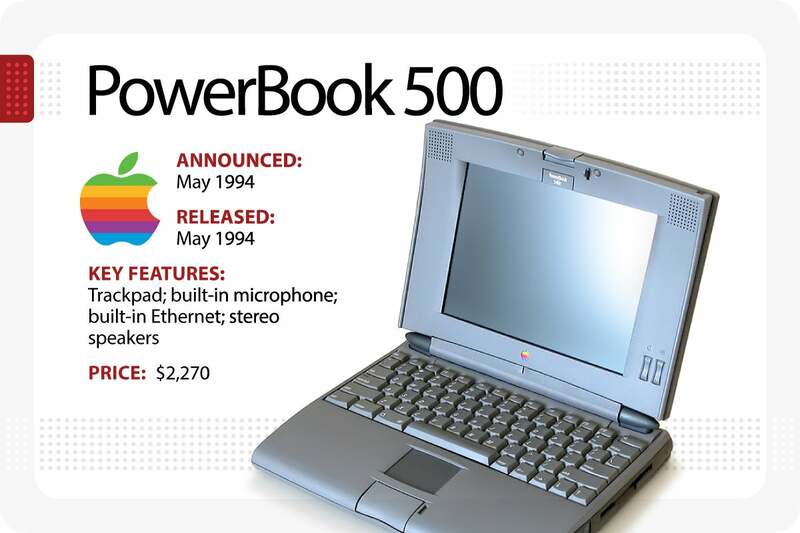 Apple released its PowerBook 500 series in 1994. It included a trackpad, which replaced the trackball, a built-in microphone, Ethernet and stereo speakers. Depending on the model, it also included a 9.5-in. black-and-white or color display and a Motorola 68LC040 CPU. 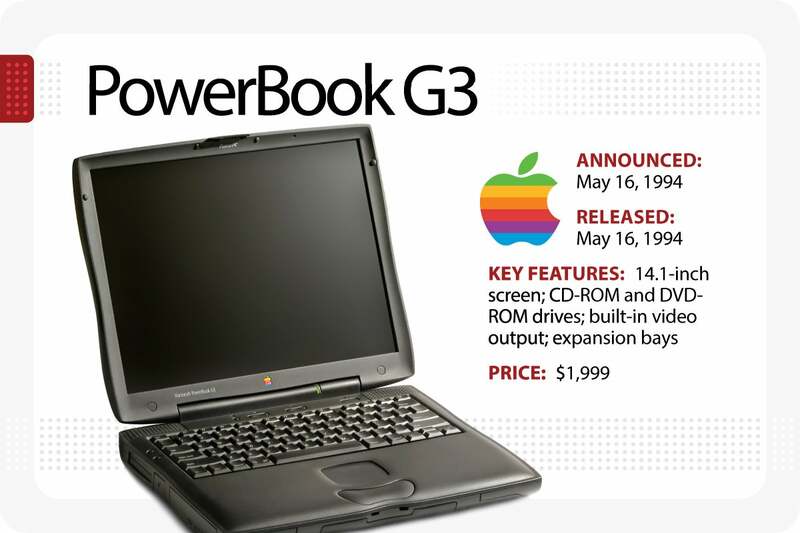 The PowerBook G3 was Apple’s most customizable laptop. It offered a PowerPC G3 chip that was up to two times faster than the Pentium and Pentium II processors used in PC notebooks and desktops, a CD-ROM and DVD-ROM drive, built-in video output, swappable expansion bays for multiple storage options and lithium-ion batteries. It also featured a flip-up keyboard for easy access to the RAM expansion slot and removable hard disk drive. Now known as the “clamshell,” Apple's first iBook design was influenced by the first iMac. 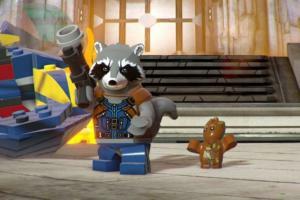 It featured a polycarbonate shell in two translucent colors, a 12.1-in. high-resolution active-matrix display, a built-in CD-ROM drive, a 3.2GB hard disk drive, wireless networking and a convenient carrying handle. 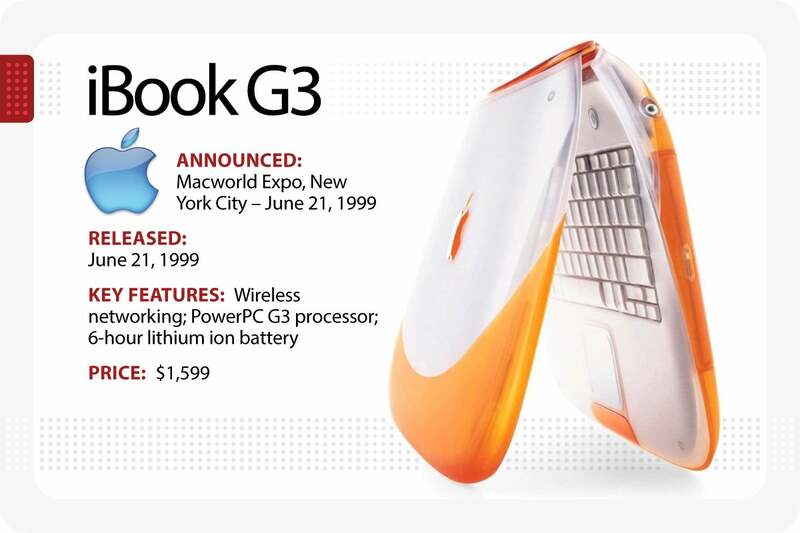 Powered by a PowerPC G3 processor, it included a 6-hour lithium-ion battery and a trackpad that supported tap, double-tap and dragging capabilities. Its integrated power plug glowed amber when the battery was charging and turned green when it was fully charged. The iBook G3 also included a sleep indicator beacon light that indicated when the iBook was asleep or turned off. Apple unveiled its Titanium PowerBook G4 in 2001. 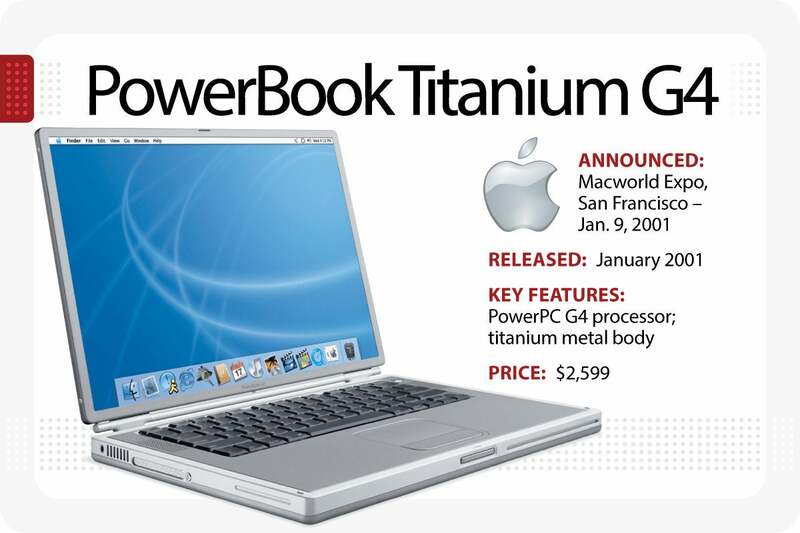 It featured a PowerPC G4 processor, a slot-loading DVD drive and had a 5-hour battery life. 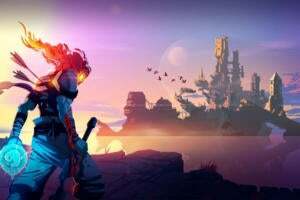 At 1-in. thick and 5.3 pounds, it included a 15.2-in. TFT widescreen active-matrix display and outperformed Pentium III-based notebook systems by up to 30%. Apple’s use of metal as an exterior casing would later become standard in all Mac products. Apple released the first MacBook Pro, which featured a 1-in. thick aluminum enclosure and weighed 5.6 pounds, in February 2006 -- nearly 11 years ago. It was the first MacBook to feature a backlit keyboard and Apple’s new MagSafe magnetic power connector -- a failsafe method to keep the MacBook Pro from getting damaged if the power cord was accidentally tugged. The MacBook Pro also included a 67% brighter display, a scrolling trackpad, and Apple’s Sudden Motion Sensor that was designed to protect the hard drive in case of a fall. The first Mac notebook based on an Intel processor, the 15-in. MacBook Pro delivered up to four times the performance of the PowerBook G4. Apple released a 17-in. model a few months later. 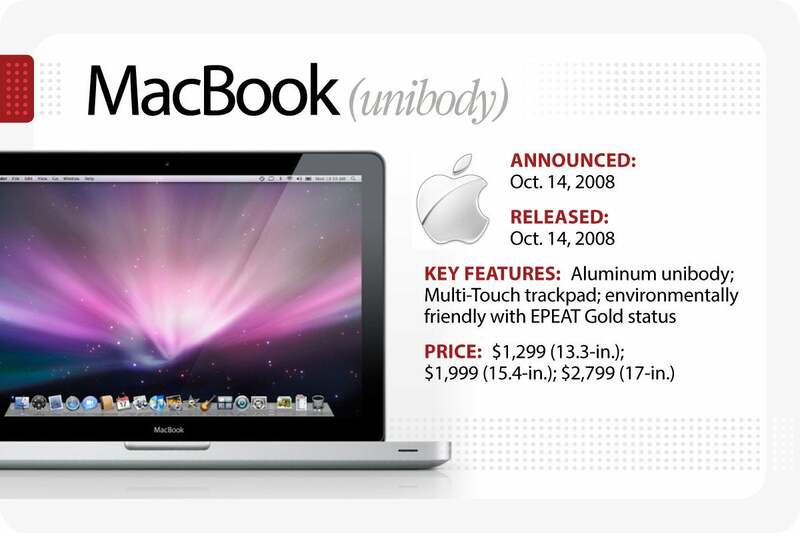 Apple released the "MacBook" in 2006 to replace both the iBook and 12-in. PowerBook so that its entire portable lineup offered Intel Core Duo processors. With its sleek design, Apple reported its new MacBook was “the world’s most advanced consumer notebook." At 1-in. thick, it was 20% thinner than the iBook. It was up to five times faster than the iBook and up to four times faster than the 12-in. PowerBook. It featured a 13.3-in. glossy widescreen display that was 79% brighter than the iBook and PowerBook, a built-in iSight video camera, a MagSafe power adapter, Sudden Motion Sensor, a scrolling trackpad and came in two colors: white and black. 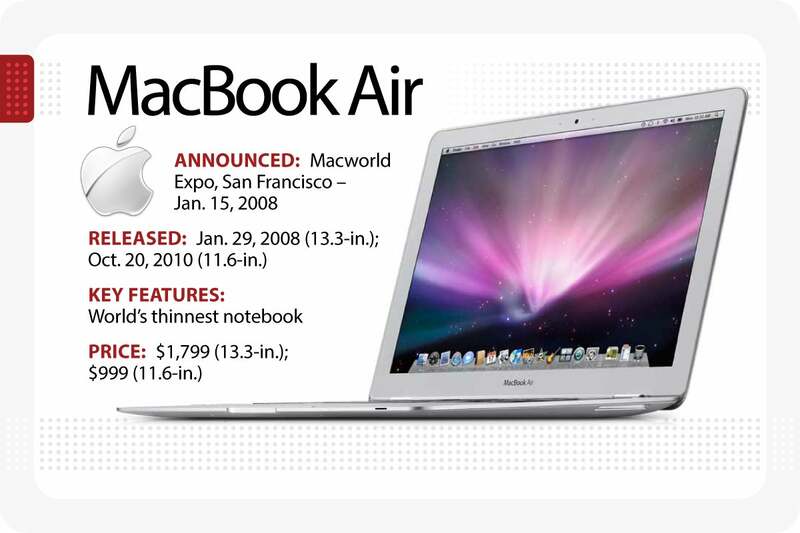 Apple’s game-changing MacBook Air was the world’s thinnest notebook when CEO Steve Jobs famously introduced it during Macworld 2008. Because of its thinness, the MacBook Air was the first Mac to remove the optical Superdrive and feature a multitouch trackpad with gestures. It included a 13-in. LED display and a full-size, backlit keyboard along with a built-in iSight video camera. Apple later introduced an 11.6-in. 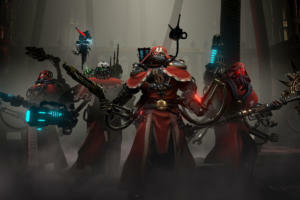 model to compete with netbooks and ultrabooks. 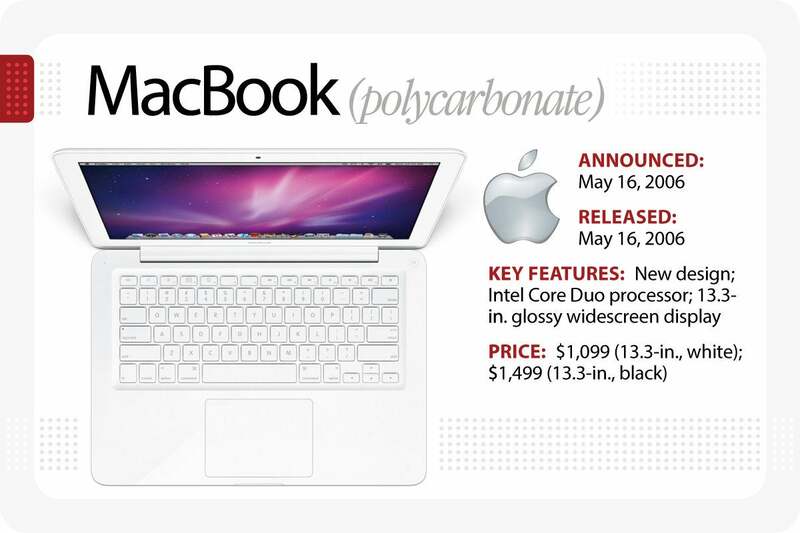 The entry-level MacBook featured all-metal enclosures, pro-performance notebook graphics and was priced $700 less than the 2006 MacBook Pro to appeal to a wider audience. 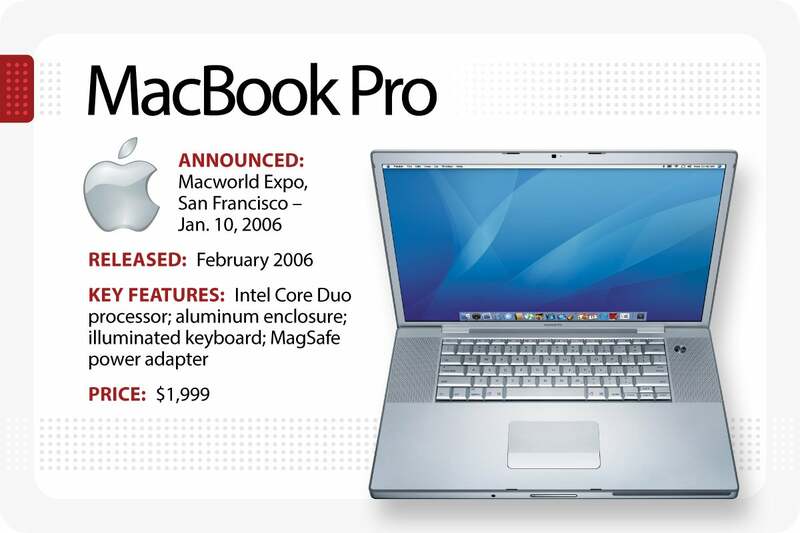 This iteration of the MacBook was the best selling MacBook in history and the world's top-selling line of premium laptops. Apple also refreshed its white polycarbonate MacBook with a new unibody look. Apple first brought its notable high-resolution display from the iPhone over to its Mac lineup with the MacBook Pro with Retina Display. At the time, it was the world’s highest resolution notebook display on the market, with over 5 million pixels -- 3 million more than a high-definition television. It was also the lightest MacBook Pro ever and nearly as thin as the MacBook Air. The MacBook Pro with Retina Display, like the MacBook Air, didn’t include an optical Superdrive but did include solid-state flash storage. Apple notably nixed the “MacBook Pro” text from the lower bezel and moved it to the bottom chassis in favor of a minimalistic look. This generation was also the first (and last) to feature an HDMI portalong with refined speakers and a thinner MagSafe 2 power port. Apple introduced a 13-in. model with Retina display a few months later; in 2015, Apple dropped the “with Retina display” suffix and updated its MacBook Pro line with Force Touch enabled trackpads. Apple brought back the beloved MacBook after the line merged with the MacBook Pro in 2009. At just 2 pounds and only 13.1 mm thick, the new MacBook overtook the MacBook Air as the thinnest and lightest Mac ever. It included a 12-in. 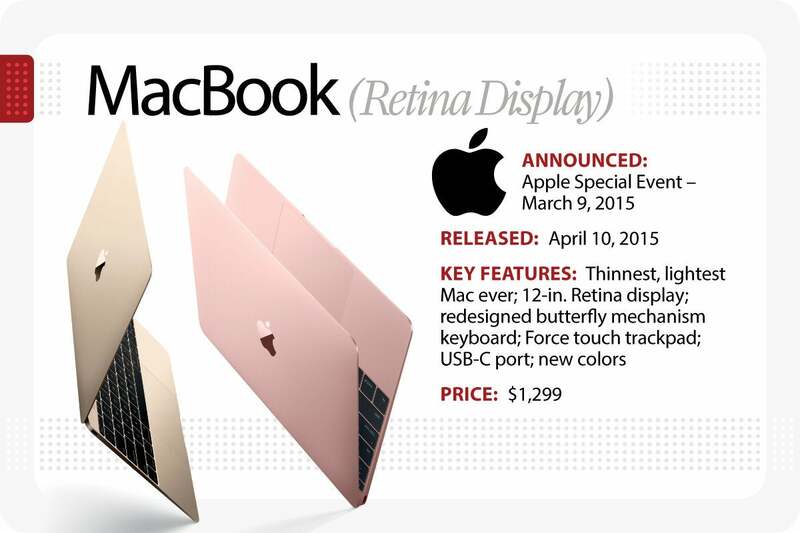 Retina display, a redesigned butterfly mechanism keyboard and a Force Touch trackpad. Apple introduced Thunderbolt 3/USB-C ports in favor of the MagSafe adapter and standard USB-A ports for a slimmer form factor and increased power efficiency. Along with a fanless design, the new MacBook was available in a slew of different colors to match the iPhone 6s and iPad Pro lineup -- gold, silver, space gray, and later, rose gold. 2016 marked the 25th anniversary for Apple’s line of portable computers. 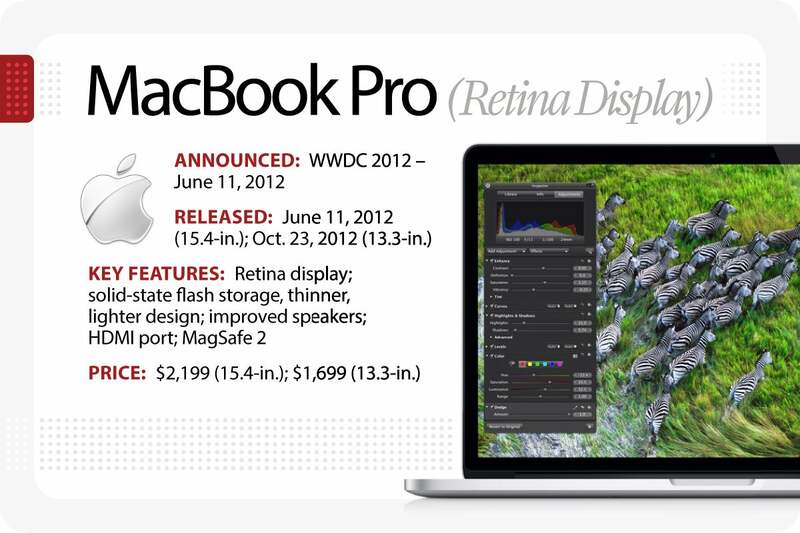 That year, Apple introduced its newest iteration of the MacBook Pro at a special event in October. The refresh included a thinner, lighter chassis that rivaled the MacBook Air -- so much so that the MacBook Pro without Touch Bar replaced it entirely (though Apple has strategically kept the Air available at an entry level price point of $999). Apple also unveiled upgraded 13-in. and 15-in. models with a new and revolutionary input device: the multitouch OLED Touch Bar, which replaced the row of traditional function keys and dynamically adapted for each active application. 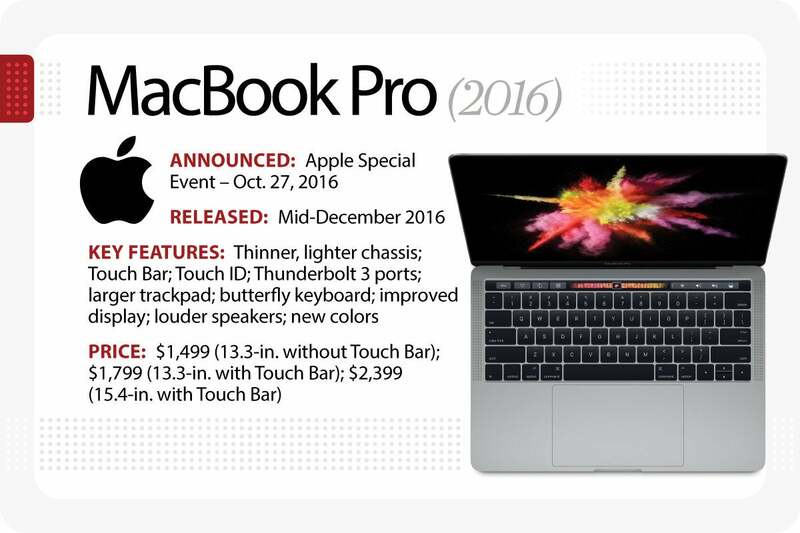 The Touch Bar models also included an integrated Touch ID sensor; Thunderbolt 3/USB-C ports; a 50% larger trackpad; a second-generation butterfly mechanism keyboard; a brighter, wider gamut display in line with the iPhone 7 and iPad Pro; a significantly faster PCIe-based solid state drive; improved speakers with better dynamic range; and a new color previously only available in the 2015 MacBook -- space gray. Apple noted there were more online orders for the laptop than there has been for any previous MacBook Pro. Apple refreshed its MacBook lineup at WWDC 2017. 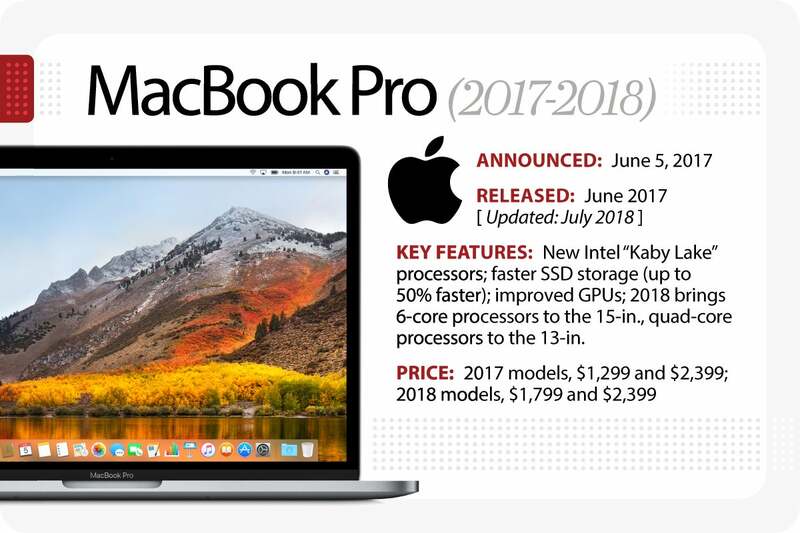 The 12-inch MacBook, which remained unchaged since its 2015 debut, finally received an updated Intel "Kaby Lake" processor, 50% faster SSD and the second-generation buttefly keyboard introduced on the late 2016 MacBook Pro. The 13-inch and 15-inch MacBook Pro's also gain the latest Intel processors as well as faster GPUs. Apple bumped down the price tag for the MacBook Pro without Touchbar to $1,299 for a 128GB model, leaving the 256GB at $1,499. The latest MacBook Air, which was long overdue for a redesign and update, finally gets a Retina display that brings it line with Apple's other laptops. Available in three colors – silver, space gray, and gold – the new MacBook Air also comes with Touch ID, an updated keyboard, and a Force Touch trackpad. It has a 13.3-in. screen, weighs in at 2.75 pounds, offerts up to 1.5TB of storage, up to 16GB of RAM and includes two Thunderbolt 3 ports. 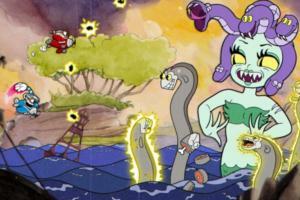 It runs on a dual-core Intel I5 chip running at 1.6GHz. Pricing starts at $1199 but can rise to $2,599.